For hundreds of years travelers to the fishing and farming village of Todos Santos, on the Pacific coast of Baja California, Mexico, made their way along a dusty old wagon track. Today, even though a two-lane highway has long replaced the wagon track, Todos Santos attracts only a fraction of the tourists that flock north to La Paz for its sport fishing and south to Cabo San Lucas for its full-tilt partying. That may be about to change. A major development has been proposed that will transform Todos Santos into Baja California Sur’s hottest new resort destination. A vast tract of costal land south of the city at Punta Lobos has been purchased by a development company that plans to transform the arid cactus desert into a major golf resort. The plan, reportedly, also calls for construction of an airport that will greatly reduce travel time to the region. What makes Todos Santos so unique is its ecology, or more accurately, ecologies. It is a palm tree oasis on the ocean, similar to those found in North Africa. The town is divided in half by a river, dry much of the year, that ends in a large lagoon. Blessed with abundant water, Todos Santos exists as a verdant paradise surrounded by miles and miles of parched cactus desert. The grand old houses that line the streets of its historic district were built on profits from mining and the growing of sugar cane. Successful as it was, Todos Santos, which was founded by Father Jaime Bravo in 1723, remained off the tourist track. As recently as 1981 the road leading in and out of the town was unpaved dirt. As is often the case, it was arrival of enterprising expatriate entrepreneurs that made the difference as they began to transform the town into a more tourist-friendly destination opening restaurants, hotels and art galleries. The menu began to take on an international flavor in 1990 when Italian chef Ezio Colombo arrived and established the now famous Cafe Santa Fe, considered to be the best Italian cuisine in Baja. Todos Santos also attracted John and Debbie Stewart, a pair of enterprising Canadians from Vancouver who had made a tidy sum of money disturbing Koala Springs fruit drinks. In 2000 they invested in an old derelict hotel — the Hotel California. Popular local mythology has it that this is, indeed, THE Hotel California made famous by the Eagles. But according to Don Henley, the hotel is definitely NOT the hostelry made famous in song of the same name. The legend, nevertheless, persists. Why shouldn’t it? It’s good for business and looks great on T-shirts. After purchasing the hotel, the Stewart’s totally renovated it from lobby to penthouse in a flamboyant style that cross-references the colorful look of Mexico and the exoticism of Morocco. Then with assistance from Belgian emigre chef, Dany Lamote, they transformed the 14-room establishment into a true boutique hotel, though John Stewart (who passed away in 2006) always hated the term. In similar fashion an American couple from the Santa Fe/Taos region of New Mexico, Don Mitchell and Alicia Dufaux, opened Cafe D’licia. Dan, a former landscape architect has turned the grounds of the small cafe into a botanical wonderland of lush vegetation (including bread fruit trees) accentuated by the presence of rainbow-hued macaws and plumage primping cockatoos. cinnamon-swirl toast which is absolutely delectable. Cafe D’licia offers an exceedingly pleasant alfresco dining experience, as do many of Todos Santo’s open-air outdoor eateries. Recently designated a Pueblo Magico by the Mexican government, Todos Santos is a community on the cusp. With the completion of the new highway, potential for development and the introduction of an airstrip, the region is sure to experience amazing changes over the next decade. Property values, I was told, are skyrocketing. At the moment, however, Todos Santos remains a quiet, quaint, somewhat off-the-beaten-path destination where the people are friendly and tourists are welcomed with open arms. You can hike the hills above Punta Lobos or walk its crescent white sand beach in virtual solitude. But it may not be that way much longer. For the residents of Todos Santos, it may be, adios sleepy village. Ola mega-resort. 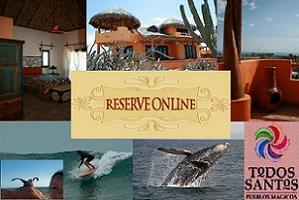 Official website: www.todossantos.cc also www.todossantosguide.com. Hotel California: www.hotelcaliforniabaja.com, phone: 011-52-612-145-0525. Room rates: $145-$190. (Winter rates. Summer rates are less). CalyCanto Casitas: www.CalyCanto.com, phone: 011-521-612-155-5480. Kuxury Casita rentals $150 and up. Restaurant Cafe Santa Fe: Calle Centenario, downtown, Todos Santos, Baja California Sur, Mexico. Open noon-9 pm. Closed Tuesdays. Phone: 612-145-0340. Open Friday-Monday, 8:30 am-3:00 pm for breakfast and Lunch. Sundays – “All you can eat buffet,” 10 a.m.-2 p.m. Cash only. Todos Santos Eco Adventures: www.tosea.net. Jim Farber is a freelance travel writer. To read features by other Creators Syndicate writers and cartoonists, visit the Creators Syndicate website at www.creators.com.